Volcano Falls at Xscape Yorkshire01977 877288work Pitch & Putt/Crazy GolfVolcano Falls Adventure Golf is an adventure 65 Million Years in the making, a quest you will never forget. Set on a mysterious island amid dense jungle, an exploding volcano, plunging waterfall and ferocious T-Rex lies two challenging indoor 18-hole mini golf courses, waiting to be defeated. 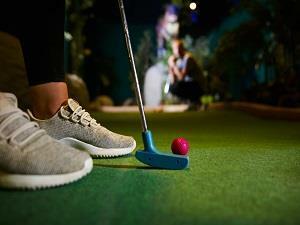 Volcano Falls Adventure Golf is an adventure 65 Million Years in the making, a quest you will never forget. Volcano Falls Adventure Golf is a clean safe family environment and we offer an immersive experience that’s fun for all the family – even big kids.